Since signing on to do these reviews, it seems I learn something new with each book, whether it is a fact about an author, a new publisher with whom I was unfamiliar, or, in the case of Dark Paradise, a new genre. Most of these revelations have been pleasant. This latest one, not so much. I think the problem may be that I am not the right demographic for this new genre. As I read Dark Paradise, something just seemed off to me. I had the feeling that the characters were SUPPOSED to be shallow, immature and confused. It turns out I was right. 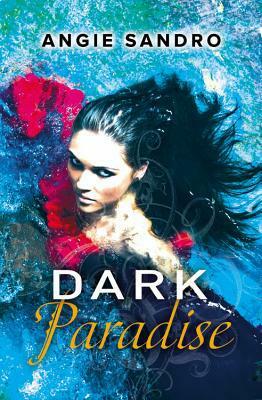 Dark Paradise is part of a new category of fiction intended to be the older sister of YA, namely New-Adult fiction. Many themes covered in young adult fiction such as identity, sexuality, depression, suicide, drug abuse, alcohol abuse, familial struggles, bullying are also covered in new adult fiction, but the various issues that are dealt with in the category hold it separate. Some common examples of issues include: first jobs, starting college, wedding engagements and marriage, starting new families, friendships post-high school, military enlistment, financial independence, living away from home for the first time, empowerment, loss of innocence, fear of failure, and so many others. Dark Paradise certainly fits. This is Angie Sandro’s first novel, the beginning of a trilogy that will include Dark Paradise, Dark Sacrifice, and Dark Redemption. The main character is a twenty something young woman in Louisiana, daughter of the town prostitute, and touched with the Sight through her ancestral line of voudou witches. Malaise (great name) hopes to join her parish police department. The book opens with her discovering the body of another young woman in her bayou, an apparent suicide. It quickly is made clear that it was murder, not suicide, and probably ritual murder at that. Mala is haunted by the girl’s ghost who demands she “Find Him.” Shades of Stephen King, she writes it in reverse on a mirror. Mala must face the animosity of a town that considers her a witch like her momma, the hatred of the girl’s religious fanatic father, alcoholic mother and creepy psychic sensitive stalker brother, while she comes to terms with her blossoming power and solves the murder. She acts like a spoiled, immature, and uncontrolled adolescent despite her age. Her reaction to the two love interests borders on abusive. We are repeatedly told she will react with violence if the townies push her, because that was how she overcame their bullying in middle school. Writing in alternating first person narrators is a tricky proposition. Sandro is not particularly adept. Mala gives way too much detail, and the prose is often violently overblown. At one point, seeing the deputy upon whom she has a crush, Mala says “The towel I wrap around my heaving chest constricts my rapid breaths like a tightened corset.” At another point she states “My arms fold across my chest with a chill that caresses my spine like an accordion being played by a zydeco master.” The first reads like a bad bodice ripper, the second is an inartful flood of purple prose. It does not improve. Andros’ style makes us listen to Mala drone on in exquisitely painful detail during moments when she is awash in adrenaline and fear. When she switches narrators to Landry, the dead girl’s brother, we are treated to almost sociopathic rambling and puerile fixation of the girls with whom he comes in close contact. How we are supposed to switch gears and accept that a man who is frightening suddenly becomes a love interest who feels safe is a leap difficult to make. Maybe it is an age gap. Maybe the reader has to be closer in time to experiencing this angst and making these horrible choices to be able to identify with the characters in New-adult fiction. That could explain why I found Dark Paradise so incredibly tedious. Or maybe it is all a marketing tactic, and this is just really poorly written. Whatever it is, it speaks ill of a book when the gothic creepiness of a bayou, ghosts, and voudou can’t even raise a little gooseflesh. A good book of that type makes you leave the lights on and scares you so much you can’t go to bed. This book just put me to sleep. I can’t recommend it. I felt like it was mostly a waste of time. In accordance with FTC guidelines for bloggers and endorsements, I would like to clarify that the books reviewed by me are either purchased/borrowed by me, or provided by the publisher/author free of charge. I am neither compensated for my reviews nor are my opinions influenced in any way by the avenues in which I obtain my materials. I received this book for free from Netgalley in exchange for my honest review.